The Bihar School Examination Board (BSEB) is going to take the 10th class examination in the month of February 2019. Now students should know the latest syllabus of BSEB 10th class. Every year, Bihar Board exam is held and is given by millions of students from Bihar. So, this year also many students will surely apply BSEB examination 2019. Here you will BSEB exam syllabus in PDF format. 7 Arithmetic Progression Introduction to Arithmetic Progression, nth Term of an A.P., Sum of n Terms of an A.P., Word Problems of A.P. 8 Quadratic Equations Introduction to Quadratic Equations, Method of Completing The Square, Nature of Roots, Equations Reducible to Quadratic Form. Step 1: Firstly, the students have to visit the official website of the Bihar Board Examination. Step 2: After visiting the BSEB official website the students need to find the Matric section to download the syllabus of the BSEB 10th class in pdf. 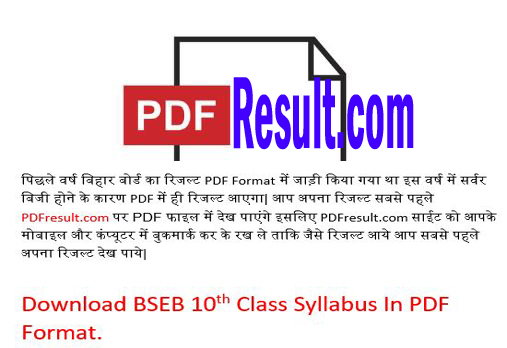 Step 3: Now after clicking on the BSEB 10th Class Syllabus Link, Pdf will download automatically. Note:- More Links Will Be Update As Soon As Possible.